More people in Scotland are dying from drugs than ever before and the deaths are hitting every part of the country. An investigation by BBC Scotland's The Nine studied the record rise in one rural area - Dumfries and Galloway. Could the increase in drug-related deaths in south-west Scotland be down to a burgeoning black market trade in pills bought through social media? Marianne hadn't heard from her daughter in three days. Her calls went unanswered. She visited Kym's flat in the small eastern Galloway town of Castle Douglas and twice peered through the letterbox. Increasingly concerned, Marianne issued an appeal to her Facebook friends. Had anyone seen her daughter? Did they know where she was? Did they know anything at all? "I think by the Friday night, I sort of knew," says Marianne. "I thought to myself, 'I think she's just lying in that flat'." The following afternoon a lone police officer arrived at Marianne's cottage in the hamlet of Glenlochar. Marianne says that it used to be the case that two officers would visit to tell someone of a death. "I just saw a police woman coming by herself and I said, 'Well, she's obviously okay then because there are not two of you'." The officer said: "I'm really sorry." "I burst out crying and shouting," Marianne says. "I was angry, devastated. I had just been talking to her a couple of days before and she kissed me and said, 'I love you, mum'. "I told her we were here, just a mile away, always at the end of the phone. "That was the last time we spoke." She'd been an Army child, moving around, struggling to make lasting friendships. When she arrived in Dumfries and Galloway, says Marianne, she was overweight and self-conscious. In her late teens, she became addicted to heroin. Kym's first partner - the father of her first child - died of an overdose in 2007. Jail became a frequent occurrence, her addiction struggle became lifelong. and diazepam, commonly-prescribed pills and a cheap alternative for heroin addicts. "Hearing from her friends in the background, I heard that she'd bought these tablets online," says Marianne. "China. Or somewhere. It was a certain group that had taken them and had died with them." Kym - a mother of two - was one of 12 confirmed drug deaths in Dumfries and Galloway in 2018. Another five deaths are likely to be added to the final tally - equalling the region's second highest drug death total. In 2017, a record 22 deaths were drug-related in this largely rural region, stretching more than 80 miles across the Solway Coast. The largest towns are Dumfries and Stranraer but the drugs deaths were also spread across smaller villages and hamlets. There are an estimated 1,100 to 1,600 "problem drug users" among Dumfries and Galloway's 148,000 residents. A recent report by the local NHS drug and alcohol group cited a greater number of people accessing their services, contributing to strain on the pharmacy budget. On commercial radio, an advert warns locals about the signs of a drug overdose. The Dumfries Courier newspaper features poignant testimony from a father "burying his son" after a lethal cocktail of heroin and tablets. Outreach workers says there was a 30% drop in the number of needles handed out to addicts last year, pointing to fewer people injecting heroin. In part this is thanks to "enforcement activities" which have disrupted the illicit drug supply network across the region. The NHS also report notes "a significant increase of drugs being obtained via the internet, namely Valium and Xanax which are in pill form and tend not to be injected". Justin Murray, leader of the drug and alcohol service in Dumfries and Galloway, said social media had been a "game-changer" for drug buying habits. "People are accessing drugs differently now," he says. "They're accessing a wider variety of drugs and they have different quantities. That is the biggest change we've seen in the last four to five years." Mr Murray says users have told him they would rather buy five Xanax tablets than a bag of heroin. He says: "They'll go for the Xanax tablets because they have a greater effect and a longer effect." Vanessa, a 39-year-old recovering heroin addict in Dumfries, agrees that her former drug of choice is "nothing" now. She told BBC Scotland that in 2017 two people died in her presence. Vanessa woke up next to her partner dead in bed. He had died in his sleep. Five months later, she found her friend dead in the living room. She had also died in her sleep. "I've been off heroin for about a year and a half now," she says. "But I was taking a few street tablets like pregabalin." Vanessa says she does not take as much now as death rates from pills have "gone through the roof". She says: "You see, that's more the era now. It's not the heroin. It's the tablets." Heroin and other opiates are still the major killer of addicts in Dumfries and Galloway. However, studies show an increasing number of deaths involve other drugs. BBC Scotland's The Nine and Disclosure studied 70 death certificates of people in south west Scotland where controlled substances were cited as a cause between 2012 and 2017. Over five years, heroin, methadone and other opiates were involved for 51 deaths. Yet other substances have shown an increasing impact in recent years, mainly benzodiazepines such as diazepam (Valium), alprazolam (Xanax), and the neuropathic painkillers pregabalin and gabapentin. Etizolam - known as fake Valium and linked to 299 deaths across Scotland in 2017 - also crops up. By the time of Dumfries and Galloway's record drug death total in 2017, two-thirds of the deaths studied by BBC Scotland included other substances in the mix. Mark Blount, a pharmacist in Kirkcudbright, told BBC Scotland that this mixture of opiates and painkillers was often a lethal combination. He says it could cause an addicts breathing to get shallower and then "they would just stop breathing". Every three months a review group - comprising NHS doctors, support workers, police and prison services - meets to discuss recent suspected drug deaths in the region. Of the seven deaths discussed during December's meeting in a Dumfries police office, all were listed as drug-related. A number of them included alprazolam (or Xanax). Andrew Carnon - a consultant in public health medicine and chair of the group - spoke to the BBC as he left the meeting. He said: "This Xanax business. That's really quite new. We haven't seen that in Dumfries and Galloway before. "I think I can remember maybe one or two deaths involving Xanax, whereas today, we really saw a lot." Xanax - an anti-anxiety medication available only on private prescription in the UK - is a wave just breaking on the area. Former drug addict Iain Campbell says he used to roam the streets for hours to find the drugs he was looking for. "Now, go on to Facebook, go on to Whats App, two minutes, sorted," he says. "And maybe only 20 minutes later it's delivered. It's too simple now." Iain got clean in 2012 after a family member died from an overdose of heroin and he is now a volunteer at First Base charity in Dumfries. He says Dumfries and Galloway is a big rural area and phone apps have made it much easier for drug users to get what they want. According to Iain, 90% of the pills are coming in from abroad in foil packages sent through the mail or courier companies. Pills like diazepam are drugs "of price, not of choice", says Mark Frankland, the founder of First Base. Some of those who died here knew one another. Vanessa donated the bed where her partner died to a friend. That friend's daughter - her name was Becky - later passed away on the same mattress four months later, an overdose of heroin and gabapentin. Two other young friends died on the same day in different flats in Annan. When one 27-year-old man died in early 2018 his Facebook friends list contained no fewer than seven other young people who had passed away in the past four years, all from drugs. One of them was Becky's ex-partner. Those friends, in turn, knew others. Social media networks such as Facebook show the connection between the people who have died. But when speaking with some users in Dumfries and the surrounding area, we became aware of another connection. There are dealer accounts set up on Facebook and operated in plain sight on the platform with the sole intention of selling drugs. In line with what Iain Campbell told us, some explained that they used such accounts from time to time to buy pills. The sellers go by names like Benzo King, Connor Benzo and - imaginatively - Valium Benzo. They describe themselves as "vendors on the dream market", offering UK-to-UK delivery, tester kits and a variety of payment methods. On offer, we find pregabalin, diazepam and etizolam. Xanax is also a big favourite. We found more than 200 such profiles offering drugs for sale. In his bio, one dealer named Diaz Aman promises: "All I like doing is giving people what they want." To test how easy such a sale would be, we set up an account and started befriending some of the accounts openly dealing tablets. Some were already trying to do business within minutes of connection. One dealer from Brighton sent us a menu. It contained cocaine, diazepam, etizolam and cannabis. He offered viagra and pepper spray, as well as VIP tickets to Wembley. We opted for a small amount of Xanax. When we asked the price, he replied: "Send what ya like and I'll send accordingly." A day and a half later, we received a package in the post, recorded delivery. In the package were 100 bars of what looked to be Xanax. Back online, vendors tag potential customers in photo and video posts of the latest batch. They display a cheerful nihilism - in one doctored photo, Pope Francis holds aloft a giant bar of Xanax as if in worship. Buyers are lining up from Falkirk, Glasgow, Stirling, Ayr, Irvine, Inverness and Dalkeith. And they are lining up in Dumfries. In the world of the "dream market", our own vendor was "100 per cent legit". The same can't be said for his pills, however. We had his batch tested by Glasgow University's forensic toxicology lab - which deals with a large number of drug-related deaths each year. Instead of sending us alprazolam (Xanax), our vendor had sent us etizolam, a substance first marketed and prescribed in Japan and linked to three times as many deaths as Xanax in 2017. Most families of people who died from drugs declined to take part in the programme. However, many expressed a similar sentiment - someone should do something. Facebook says its "adversaries" are "constantly evolving their tactics and terminology to avoid detection". The social media site blocks and filters terms associated with drug sale and employs more than 30,000 people in safety and security on the site. In a statement, it said: "When we become aware of content on Facebook that is facilitating drug sales we remove it, and fan out to look for associated profiles, pages, groups, hashtags and accounts involved in similar activity." The statement added: "After a thorough review, we identified and removed 11 accounts related to content the BBC brought to our attention, and fanned out to remove an additional 16 accounts associated with these profiles involved in similar activity." With drug dealing on social media sites so visible, what are the officers in Police Scotland's smallest division doing to combat the problem? Det Ch Insp Colin Birnie said: "In recent months we've probably taken out several thousand tablets which we suspect are Xanax. "We've got intelligence that they were getting delivered in the postal system. We instigated the appropriate protocols and we took them out of the postal system." He said it would be "naïve" not to think social media would increase the availability of drugs. Det Ch Insp Birnie said it gave dealers a "bigger platform". This month, a two week-long operation targeted pill dealers across the region. 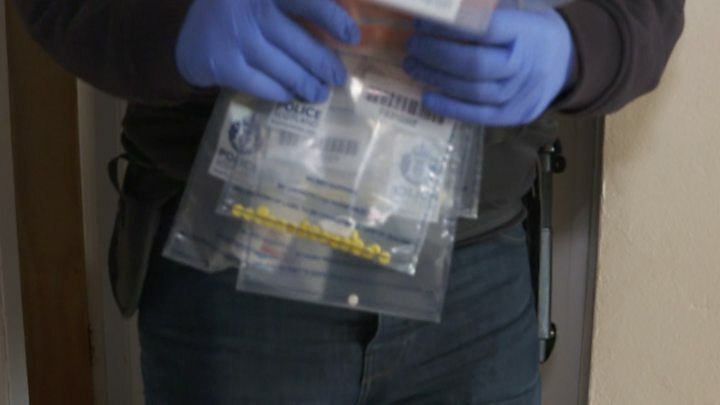 At one raid on a flat in Stranraer, officers searched the occupants - the owner took a while to be roused - and produced bags of what detectives told the BBC were fake diazepam tablets, as well as tubs of Xanax, complete with the branding. Two men arrived at the flat during the search. One was taken away after he was found with drugs. Police saw the operation as having a good result. Across 11 addresses, officers seized the usual substances - heroin, cocaine, cannabis - and eight people were arrested for dealing. In among the seizures, they found about 1,000 tablets believed to be counterfeit diazepam and Xanax. Privately, with pills coming through the post, one police source said stopping the problem is like plugging holes in a dam. In 2017, a record 934 people died as a result of drugs in Scotland. In the first half of 2018, more than 500 died - about 100 more than the same period a year earlier. It's not just confined to the cities of Glasgow and Dundee - areas such as Ayrshire and Forth Valley have seen steep rises. This story is probably happening in your town. Dumfries and Galloway reflects larger trends. Drug users are getting older. If you're an addict in here, your chances are good - 98% wait less than three weeks for access to services. Only 0.8 per cent of users die here - the lowest rate in the country. However, your chances were better five years ago. "It is extraordinary that that we've lost so many people and yet it's kind of almost gone unnoticed," says Mark Frankland at First Base. Justin Murray says many people think 'who really cares if a drug user dies?' but each one is a son or a daughter and often a father or a mother. He says there is a "big ripple effect" when a drug death happens that affects many people. According to Marianne, who lost her daughter Kym to drugs: "No happy ending ever comes from a drug story. "It always ends up sad. And just going through it is just your worst nightmare. "For a mother, a father, sister, brother, grandparents. It's just your worst nightmare. And it's waste. A waste of life." It is not just confined to the larger towns of Stranraer and Dumfries. They are dying in the villages like Sanquhar and Thornhill. They are dying in Kirkcudbright, Dalbeattie, Lockerbie. They are dying in Annan. We are more connected than ever before - send a request for what you like and they will supply accordingly. Even in these most rural of communities, Scotland's highest drug death levels are causing a ripple effect. Kym was dying in Castle Douglas. Disclosure: These pills may kill you is on BBC One Scotland at 20:30 on Monday 25 February and on the iplayer.